Rosa's Yummy Yums: ENGLISH FRUIT LOAF - CAKE ANGLAIS AUX RAISINS SECS ♥ A GUEST POST FOR BEN AT "WHAT'S COOKING MEXICO?" Ça, ça s'appelle le bonheur! Avec un grand "B"! OK, I should give it a try! I'm not such a big fan of fruit breads but yours is looking very delectable. 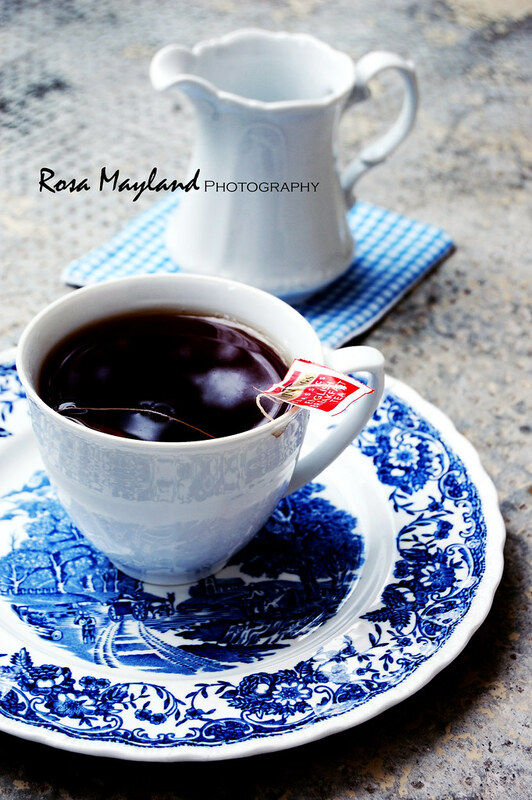 Rosa, I like your kind of styling and the fruit bread on this blue plate looks gorgeous. It isn't so simple to style food with brown shades I think. I love how the pattern goes with the shape of the bread. Please excuse my bad english but you'll understand what I mean, I guess. Guère présente en ce moment, beaucoup de travail au dehors. Mais je ne t'oublie pas. Bisous et bon WE. ooooh I love fruit loves ...yummmmmmmmm and moist :)gorgeous pictures. Love the cake and love the photos Rosa really I enjoy your posts!! have a nice weekend! It looks awesome! Perfect for the afternoon tea. Looks great! I love good fruit cakes, this seems similar in all the best ways. I have always wanted to make an English fruit cake. Now I have found the right recipe! Have a wonderful weekend, Rosa! Mhh, avec un délicieux thé Earl Grey! Lovely loaf! I'd like a slice (big one!) and a cup of tea... and a nap! Gorgeous photos as always. Un clásico cake inglés me encanta esta´de lujo, excelente receta el color es hermoso,abrazos hugs,hugs. How exquisite. I'm a huge tea fan and this looks like a perfect snack. I love fruit cakes!!! Yours look wonderful!!! It looks amazing!Love your food styling and marvellous pictures! Have a great weekend,dear Rosa! This cake looks wonderful! Will stop over and check out your guest post. Yes, there's always something we're looking forward to in our lives. That's the joyous thing to do. And your cake sounds incredible. Hoep you're having a wonderful weekend, Rosa. Merci Rosa pour tes bons voeux. The cake gets a wonderful color and taste of the raisin. Fantastic tea loaf. One of my favourites!!! I will hop on over Rosa. I have been following ben for years and love his move to Mexico. Thanks for the intro, Rosa! 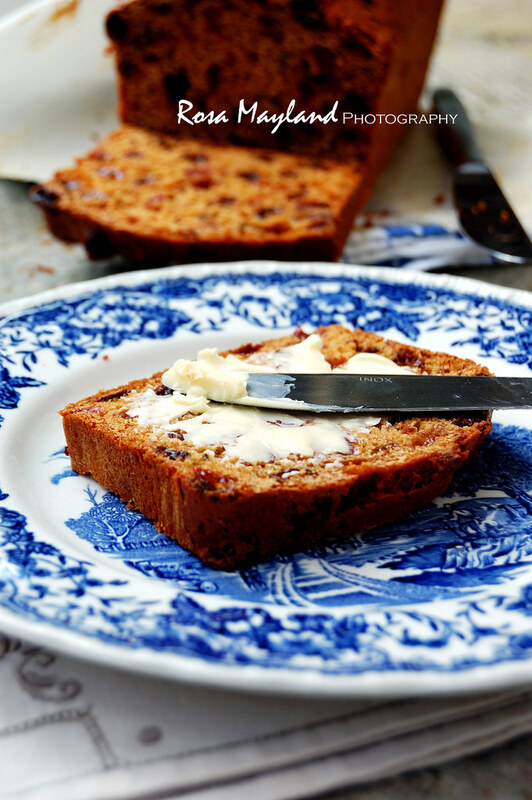 Love this tea bread...chock full of delicious things. Il est splendide Rosa, aussi beau que tu me l'avais décrit. Coming here is indeed a feast for the eyes - I so enjoy it. I have lately been craving Mexican food - all fresh - no gloppy sauces so will be hopping over. You can't beat a good fruit loaf and cup of tea! Wish I could share with you. How exotic! I would love to have a slice of this dried fruit studded cake with my tea. Un cake qui comporte plus de fruits que de farine, cela me va parfaitement. Well it sounds very authentic and looks delicious - a wonderful recipe and thanks for sharing! je craque....sauf pour le thé noir mais bon...dans le cake...faut pas être sectaire. en revanche, j'ai une question à te poser : voilà, je recherche une recette de cake moelleux, très moelleux! tu sais, comme ceux que l'on achète et qui se conservent plusieurs jours. Je n'arrive pas à la trouver, j'en ai essayé des tonnes. Au cas où tu aurais cette merveille tu peux me contacter via facebook, mon blog etc...en tous les cas, tes photos sont comme d'habitude surperbes. 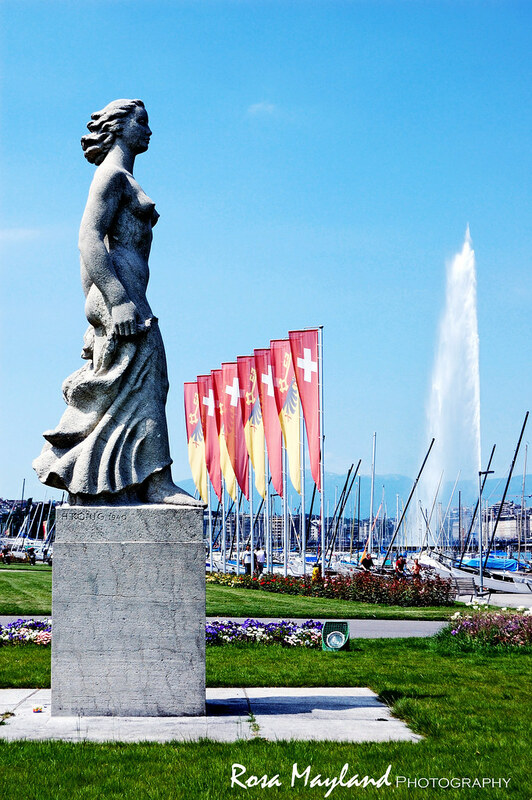 The photo with the statue and the Swiss flags in the background is really wonderful! It's always a treat to come here, especially today when I find a recipe really close to my heart. Actually I have that National Trust cookbook and absolutely love. Can't wait to make this cake again. Have a nice Sunday Rosa. Tu penses bien que j'adore ce cake Rosa. As always, your photographs are beautiful Rosa and this cake looks divine! I just want to grab a slice off the screen and gobble it up! Your plate on the last shot is so beautiful! Have a great day. Your photos always make me want to lick the screen - and to take photography lessons from you. Would that you lived closer! I feel exactly the same way Rosa. I may sound rude or arrogant when I say this, but sometimes it appears that mediocracy is celebrated more than talent. So like you I too look for unique, stimulating, inspiring and talented people. Your cake looks fantastic. I'll hop over to Ben's. I agree with you that our palates get more sophisticated over time. How many toddlers go from eating only what "they know" to discovering the wonders of the gastronomic world. This is such a great looking breakfast and snack cake!! I see sunny days in your beautiful photos! It's important to be raised in a curious / adventurous food environment. I think it even helps us to shape our personality as we travel and learn new things. Food is such an integral part of it all. That bread has such a beautiful texture. I can eat it any time! Je ne me suis jamais lancée dans ce classique que j'adore mais là, tu me tentes avec cette recette et tes belles photos ! Pour moi ce sera aussi avec du beurre… salé ! oh man that sounds delicious! A slice of this cakefor me with a cup of tea, will be perfect for a break. Il a l'air délicieux ce cake ! I think most think of stale fruitcake, the same one that's been passed around for years, when they think of fruitcake lol This one begs to differ..what a beautiful fruit loaf..it looks so moist! Love Ben's blog..will stop by and check out your guest post! That looks wonderful Rosa-full of lovely fruit! And yes to answer your question, we did dine at Cafe Des Federations and had a great time! A very delicious looking recipe yet again, just love how you take your photos! Noting better than a slice of fruit loaf and a cuppa. Simply gorgeous photos! Your fruit loaf looks very delicious. His blog is one of the best! You turned this recipe into an elegant dessert with those beautiful pics! 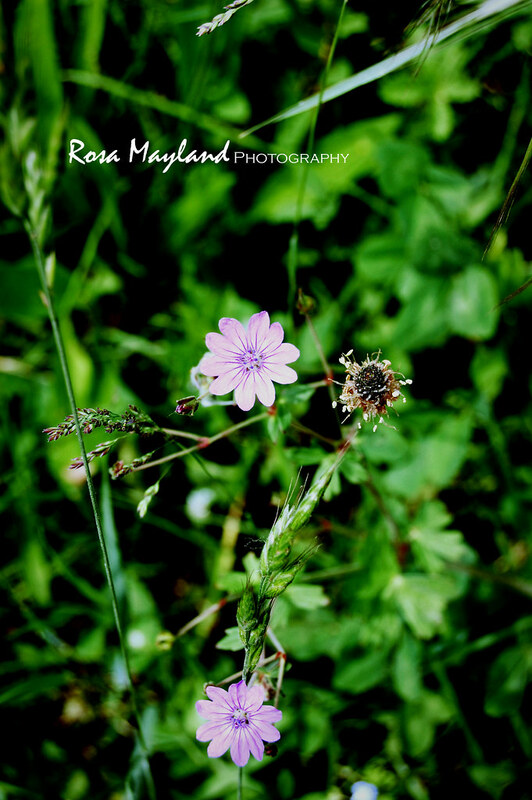 Just came back from Ben's blog...great post Rosa! 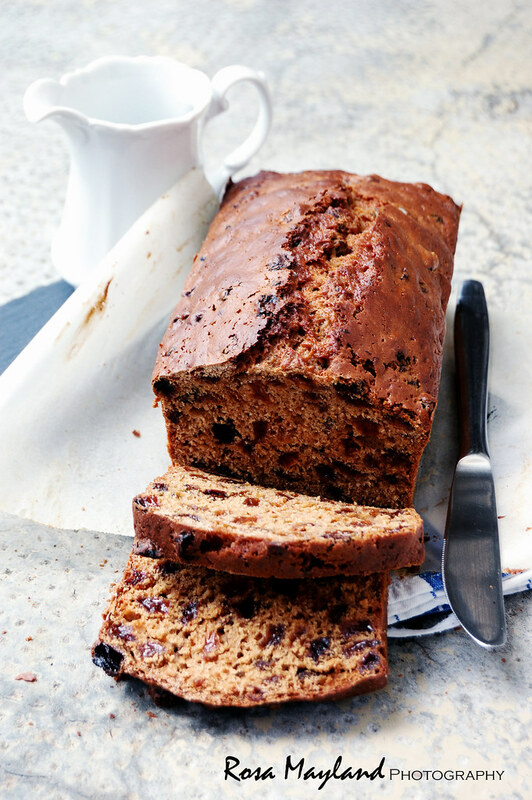 Your fruit loaf looks delightful with a cup of tea! I'm on my way to Ben's site to read your post there. lovely pics, a tasty sweet treat!! off ot chekc out your guest post, hope your weather is better! I'd take this one over that one any day. What a gorgeous fruit loaf Rosa. It reminds me of something my grandmother used to make. Oh, I love fruit cakes and wish I had some now with my Greek coffee. Woo English recipe! Sounds gorgeous, Rosa. As always, adoring your beautiful photography. Love the write up and your fruit loaf looks absolutely great! Love the fruit loaf but I especially love the food styling looks stunning! Thank you for sharing this on my blog my friend! It was a great contribution and now I'm starving for one of these loaves. Definitely heading over to check this out! I love Ben's blog! Oh my. It looks so good! Ben's blog is beautiful and I love how he captures life .. so real! The loaf sounds lovely and the black and white shot of the same is absolutely brilliant! Ohhh...This is simply BEAUTIFUL, Rosa! That fruit loaf looks perfect and your pics are truly spectacular! I'm off to check to Ben's blog now. that's a hearty and delicious loaf of cake, rosa! i love all the add-ins, so well done! Très appétissant ton cake avec une tasse de thé!! You can submit your english fruit loaf cake pics on http://www.foodporn.net It is a food (and drink of course) photography site where members can submit all food (and drink of course (again) LOL ) pictures that make readers hungry. Chouette, les vacances commencent pour moi, je vais pouvoir prendre le temps d'apprécier un vrai petit déjeuner avec pourquoi pas un beau pain comme tu présentes! Thanks for the Cake Anglais Aux Raisins Secs recipe. If you don't mind, can you submit your Cake Anglais Aux Raisins Secs photo in http://www.foodporn.net ?